Can we talk about chili? Everyone seems to eat it differently. To me, chili is soup. I like it served in a bowl with a spoon and maybe some sour cream and grated cheese on top. Oh, and a carb-y vehicle of some kind to dip in it, like naan bread or taco chips, or a bun or a biscuit……you catch my drift. My Main Taste Tester treats chili like a sauce and he throws a fit if there’s no rice to ladle it on to. One of the first times I made him chili, he asked me, “Where’s the rice?” I’m sure I looked at him like he was nuts, but that’s the way he was served it all his life and that’s the way he likes it. So now we have rice AND the aforementioned carb vehicles when we have chili. Nothing like a compromise, eh? Today I’m introducing you to my favorite basic chili recipe; it’s the one I make time and time again, that I could make with my eyes closed and it always turns out perfect. The ingredient list is super simple too. I love adding three kinds of beans and some corn to make it really hearty. It is such a relief to come home out of the cold to smell this simmering away in the crockpot. Whether you decide to put it on rice or dip a biscuit into it, I’ll leave that part to you. Fry your beef until browned and cooked through. Drain any grease. Place into crockpot with all remaining ingredients. Cook on low for 7-8 hours or on high 3-4 hours. I fry my beef the night before I want the chili so I just have to put everything in the crockpot the next morning before I go to work for the day. 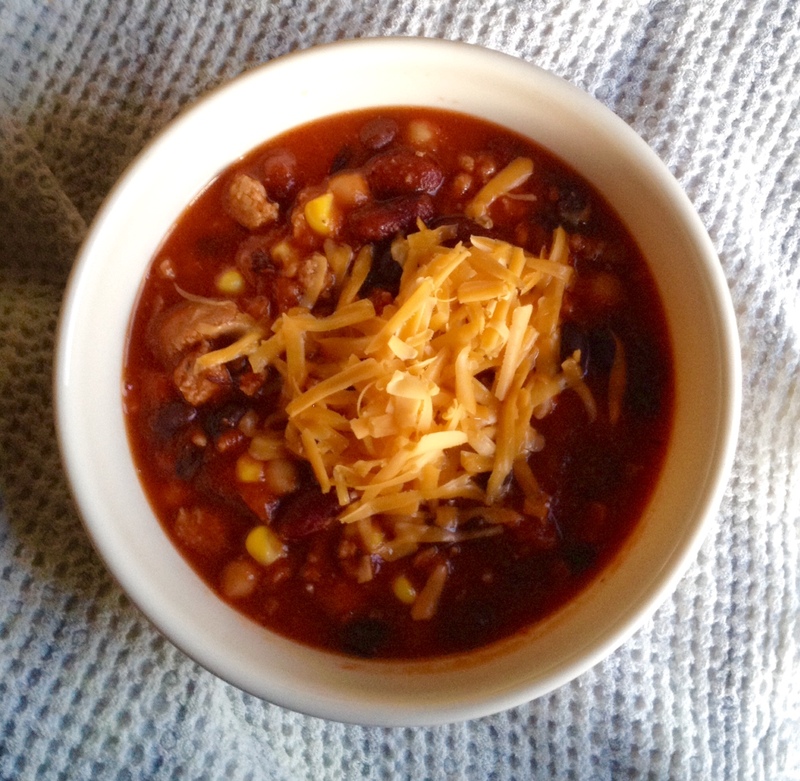 This chili tastes even better the second day and freezes great. You can also cook everything together in a pot on the stove top; I just find the longer it cooks, the better it tastes.